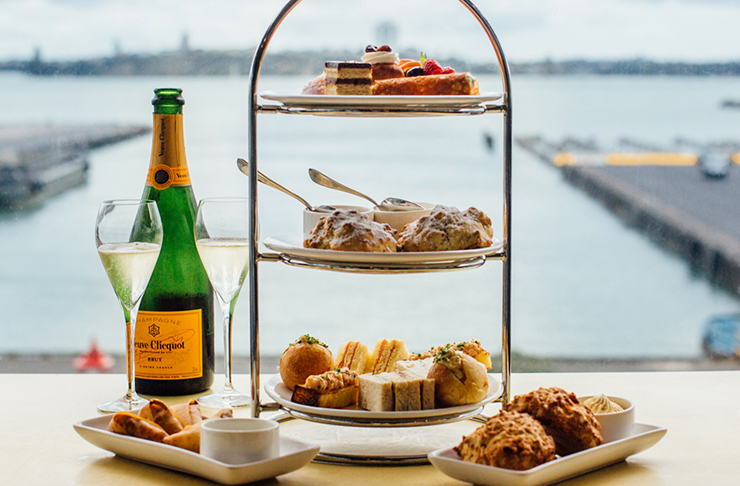 What better way to treat yourself than enjoying one of Auckland’s best high teas? Let’s face it, it’s nice to feel that you’re a little bit classy. Those awesome, tea and cake (and sometimes champagne) filled occasions that allow us to get dressed up and drink flowery, fruity teas and sandwiches without even a speck of crust. Whether it’s Mother’s Day, a graduation or you just want to spoil that special someone, high tea is the perfect thing to do. Not only do you enjoy tea, cake and sometimes a glass of bubbles, but they’re also a great present for your mum or grandma, as well as for a hen’s party for a bride-to-be who has asked you to keep away from other antics. Lucky for us, various venues across Auckland serve up swanky high tea that we think would be good enough for the Queen herself. Without further adieu, here are the best high teas in Auckland. 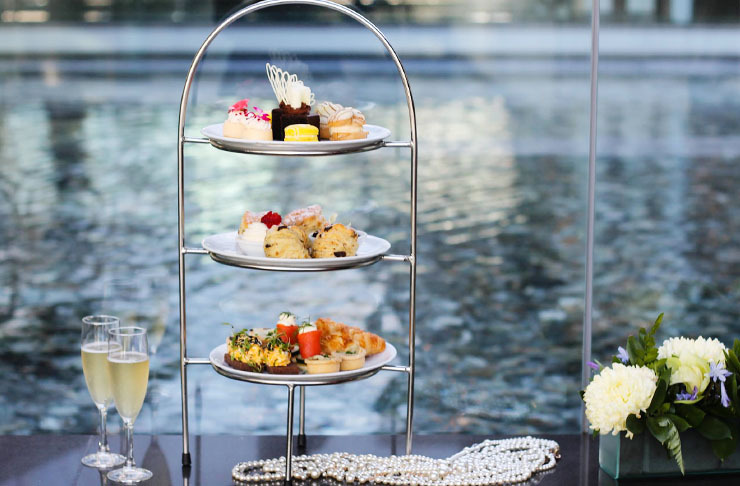 Start your search for the high tea in Auckland at The Cordis' Lobby Lounge. Get dressed in your flowery best and relax in one of their plush chairs beneath a beautiful chandelier with a glass of champagne (of course). Prepare those taste buds for a couple hours of pure delight. Served on tiered, silver stands, you’ll find delightful finger food like your grandma used to make. You’ll find dainty sammies with the crusts cut off, warm and fluffy scones, followed by the cutest little sweet treats imaginable. Finish it all off with a delicious tea—we could seriously get used to this life. High tea at the Cordis is an absolute must-do for every Aucklander. From 10 - 11.30am and 2pm daily, you can enjoy high tea at Cornwall Park Bistro. This stunning venue, in the heart of the rolling hills of Cornwall Park, is a treat like no other. With various places to sit, nothing can beat the deck on a sunny day. There are so many tea options, you’ll be spoiled for choice. From rare white teas to Japanese green tea, Cornwall Park Bistro high tea has it all. And the food menu is just as delicious. Savoury treats include caramelised onion and blue cheese tart, smoked fish croquette and pork sausage roll. Just leave room for the sweets, because there’s chocolate tartlets, salted toffee eclairs and, naturally, warm puffy scones. If you’re looking for an alternative to high tea in Auckland City, then we suggest you plug Waitakere into Google Maps, stat—they say West is Best for a reason, you know. For the ultimate luxury escape, head to Waitakere Estate and soak in the views of the Waitemata Harbour, mighty Rangitoto and Auckland City while enjoying one of the best high teas in Auckland. If you think high tea is simply a few hours, then think again. You can up experience at Waitakere Estate by booking the Ultimate High Tea Package. With a night in deluxe accommodation, high tea and a three-course a la carte dinner for two, it’s like high tea on steroids. One of Auckland’s best-kept secrets is the Eden Gardens. Here, you can truly take a step back in time as the cafe is like visiting your grandmother, with its aged decor and seating. It comes as no surprise then, that they also serve up high tea. Relax in the lush surrounding and indulge in chicken and cucumber club sandwiches and sundried tomato filo cups. Or, from the sweet side of Eden Gardens’ high tea, you’ll enjoy the likes of macarons and mini lemon meringue pie. Naturally, you’ll enjoy tea and scones, too. Situated in the Seafarers building in Britomart, Ostro has won the heart of many an Aucklander with its delicious food, friendly and talented staff and the spectacular views. Nothing beats the beauty of Auckland on a sunny day...except, perhaps, high tea on a sunny day. That’s right, one of Auckland’s best restaurants also serves up delicious high tea for you to enjoy with your mum, your gran or your besties. Slightly hidden, you’ll need to go up the elevator, but when those doors open, you will be impressed. With large, sea-facing windows that are left open on sunny days, it’s one of the most beautiful places in Auckland. Ostro’s high tea menu has been carefully curated by Josh Emett and his pastry team. The savoury menu includes a prawn toastie and roast mushroom and parmesan quiche. This is followed by delicate sandwiches filled with curried egg, cured cucumber, champagne ham and smoked salmon. The sweet menu is indulgent charcoal pavlova, yuzu meringue tart and passionfruit marshmallow, to name a few. Naturally, there’s also the fanciest teas to choose from...but no doubt you’ll also want to buy that bottle of champers. Auckland's original tea kiosk continues to serve up a delectable high tea on the first and third weekend of every month. Think three-tiered stands chocka with deliciousness, including the crowd-favourite scones with cream and jam. The Wintergarden Pavillion serves premium teas or bubbles to be enjoyed with your tower of treats. An inner-city oasis in the Auckland Domain, it’s a must-try. Take a leisurely stroll afterwards and soak in the beauty. Situated in the heart of Auckland City, you’ll find Stamford Plaza. More than a hotel, it is a fabulous venue for dining out, having an after work drink and—of course—high tea. This is your chance to sit back, relax and let someone else do the hard work for you. Their savoury options include champagne ham and English mustard on spinach bread, their signature chicken curry puff, cucumber and cream cheese wholegrain finger sandwich and tomato and pesto quiche with cow's feta. 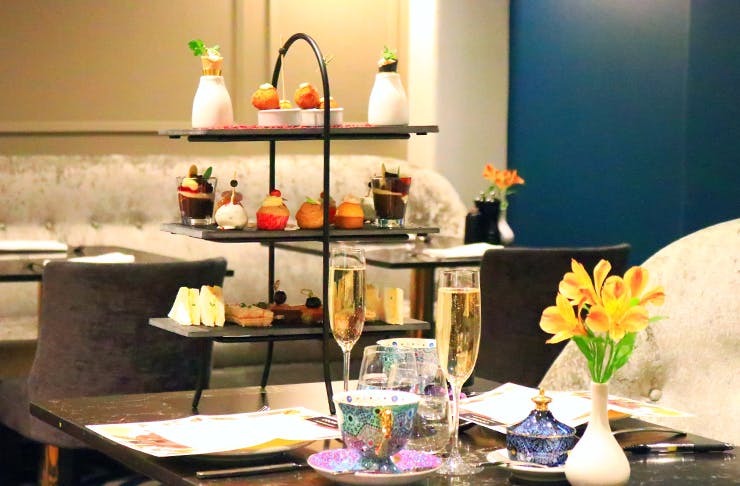 This is followed by a range of mouthwatering scones, indulge in a mini Kiwi pavlova, strawberry cheesecake dome, a passionfruit macaron, saffron and pistachio rice pudding and a rhubarb financier with gin and tonic frosting. High tea at Stamford Plaza is one of the best things to do in Auckland. If you thought high tea originated from Britain, think again, because it was a trend that started in France a full 22 years before England. And, in the heart of St Heliers, you’ll find La Fourchette, a French brasserie following this tradition and serving up delightful high tea for your eating pleasure. While you can dine at this seaside venue morning, noon and night, high tea is on offer each day between three and five pm. You know it’s going to be good when they’ve developed their own pastry range, La Petite Fourchette. Under the guidance of Pierre Roth, the team create fresh delicacies every morning in preparation for the day ahead. In true French style, the high tea menu includes, among other items, salmon rillettes on mixed grain bread, duck liver parfait and delicious ham and cheese toasted sandwich. When it comes to sweets, your taste buds will be dancing as you try the hazelnut and chocolate mousse or bite a delightful macaron. Naturally, you can choose from tea or bubbles, but there is also a cocktail option if you really want to indulge. Get the time right, and you can keep the buzz alive by walking along the beach just as the sun sets. Bliss. If you live in South Auckland or fancy a drive, head to Manukau to enjoy high tea at Fisher House. Found on what used to be a racing horse, this is one building seeped in Auckland history. Once the home of Sir Woolf and Lady Fisher, it was built with entertaining in mind and includes a grand lobby, a sweeping, curvy staircase, a billiards room and a stunning garden terrace. And, if high tea at Fisher House was good enough for the Queen Mother, chances are, it’s good enough for you too. Served on a three-tiered stand, choose from high tea, royal high tea or even the majestic high tea. Each includes finger sandwiches, fresh homemade scones with jam and fresh cream, a hot savoury, a sweets selection and a collection of sweet pastries and slices. Opt for tea, Marquis de la Tour French bubbles or a flute of Mumm Cordon Rouge, depending on your tastes and extravagance. Fisher House also caters to sprogs with their kids' high tea—it includes fairy bread, butterfly cake, a hot savoury and a fluffy. So, head South now, and enjoy one of the best high teas in Auckland. Another beautiful venue to enjoy high tea is at the Hilton’s Bellini. The expansive area boasts some of the best views of the sparkling Waitemata Harbour with floor to ceiling windows and the option to sit outside on a fine day—you’re practically on the water! With plush chairs to sink into and excellent staff to cater to your every need, you’ll feel like the Queen herself. Bellini offers three different high tea options. The first is the refined high tea, with your choice of two hot beverages and a full selection of savoury and sweet, the second is the mixologist's high tea, where you swap your hot drink out for two cocktail teasers and finally the bubbly high tea where you can choose between three glasses of bubbles or cocktail teasers and still get two hot beverages. One of the best high teas in Auckland is at Bluebells Cakery—given their talent for delicious and beautiful food, it's a must. Served at both their Kingsland and Hillsborough venues, there are a number of high tea menus to choose from—standard, pregnancy friendly, vegetarian, gluten-free and kids. Is there anything they haven't thought of? There are no champers at this high tea, but there is Supreme coffee, tea, juice or other sparkling drinks to choose from. The savoury menu included herbed chicken tea sandwich, a mini quiche Lorraine and even that Kiwi classic, the sausage roll. Onto the sweets menu, there's a mini cupcake, cheesecake, macaron, tart, coconut ice and a scone with jam and cream. 24-hours notice is needed for all bookings and is available any day of the week. 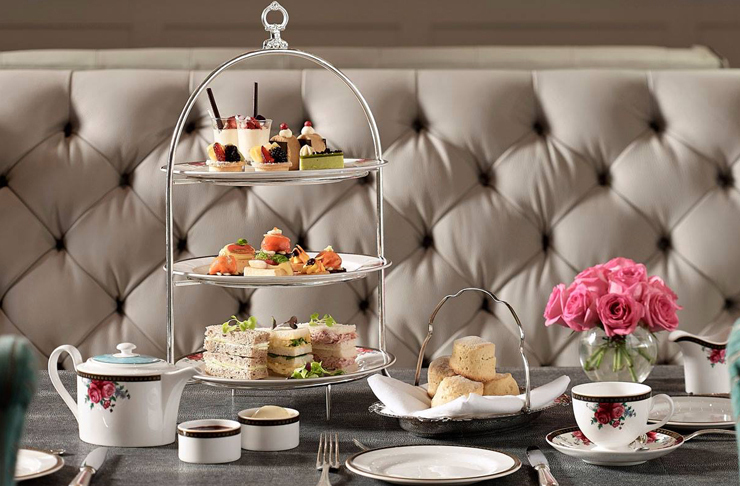 The Sofitel describes their high tea as a tantalising tour de force. The warm, plush lobby will make you feel welcome in no time. Take a pew in one of their lush chairs and get ready for one of the best high teas in Auckland. Taking this European tradition very seriously, they’ll take your taste buds on a sweet and savoury adventure that you’ll adore. Enjoy a tea, or take things up a notch with a flute of champagne—pinky raised, of course. If there is one venue for high tea in Auckland that is a must, it is Hotel de Brett. Taking things to the next level, they host a roaring '20s high tea between one and four pm every Saturday and Sunday. Here you're encouraged to dress up, flappers and dappers style—a pack of faux pearls, headbands, long gloves and bright feather boas is available for an extra $15. Kick things off with an Easy St cocktail—gin, elderflower, cucumber, lime and soda. Dive into the 1920's-inspired eats that include deviled eggs with crispy prosciutto and smoked salmon pinwheels. The sweet menu includes pink pavlova and strawberries, passionfruit lamingtons and lemonade scones with cream and jam. Wash it down with a tea or two, or choose from a variety of cocktails. We know where we’ll be this weekend. A modern take on this afternoon classic, High Tea at Hotel Grand Windsor is far from the simple English breakfast, biscuits and tea trolly. Serving your favourite sips in exclusive fine bone china by T2, the spread before you is just calling to be photographed. The high tea is served daily from two until four pm. There are three different options to choose from—tea, wine or champagne. The snacks at this high tea are both dainty and delicious. Every dish is crafted in-house, using only sustainable and locally sourced foods that sing with flavour. Start with the savoury specials of cured salmon with dill or arancini with aioli, then move onto the sandwiches—chicken and walnut, ham and cheese or a good old egg mayo. But save room for the sweet treats—isn't everything just better in mini form? We’re talking buttermilk scones with strawberry and rose preserve, elderflower profiteroles, geranium truffle pops and much more to satisfy a sweet tooth.